Hello and thank you for being with us Jenna. Lets start out with the normal questions. Who are you, where are you from, where do you live now, what is the title of your book, what is your book about in 20 words of less, and where can readers follow you? My Name is Jenna Morland, I am from a small town in Northern British Columbia, Canada but I grew up in the mountains in Southern BC. The name is my book is Empress Unveiled. 20 words or less... A sick teenager. Her very "human" best friend. A fae sentenced to death. She loves them both. 1 broken heart, 1 death, 1 crown. I am the most active on Instagram & Twitter. I will include all the links I have. Lets talk about books what book or books have had the most impact on your life both as a reader and an author? I would say definitely the Harry Potter series had a huge impact on my life. I started reading the first book when I was 12 and it blew my mind. I would dream of that world all day and read it all night. I would say Twilight had the most impact on me as an author. Like me, Stephanie Meyer didn't have much experience writing. She was also a full-time mom and I guess she made believe that it could happen to me too. We all love bookish goodies so tell us What are your favorite bookish items (besides actual books)? I LOVE reading socks. I have so many pairs! They are so thick and warm and make for the best Christmas presents! Your book looks like it might have some romance in it? Does it and what do you think makes a compelling romance in a book? It does have romance! 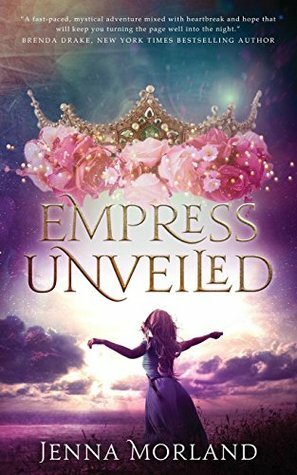 I think Empress Unveiled is a good balance between the fantasy as well as the romance. I love a good love triangle and I find the human heart to be compelling to write about. The uncertainty and the confusion that comes along with falling in love for the first time is so addicting to read. What is one thing that you think readers should know about your book? I love the characters of this book and the readers will too. I have had many people tell me they finished the book in less than 2 days because they couldn't put it down and that's exactly what I was going for. The only one I can think of is when the book is made into a movie and it in no way does it any justice. Did you always want to be a writer? If not what did you want to be? And when did you first consider yourself a writer? I didn't no. I got a C in Grade 12 English. I loved to read but never really opened myself up to writing until a few years ago. I don't think I really considered myself a writer until I got a publishing deal. Even now I struggle with it. Did it take a long time to get your first book published? And who is your publisher and why did you choose them for your first book? It took about 4 months of steady querying to get my publisher. I chose Oftomes because it just felt right. In one email to them I actually said that my book was meant to be published by them, turns out--I was right! I am currently working on the sequel to Empress Unveiled. We are hoping for fall of 2019 release. I do have a side project I will go back to once I am done the sequel. I really enjoy writing in YA but NA does intrigue me. Last but not least the one question that you will most likely be asked a lot. If your book was turned into a movie and you could pick the cast who would you pick to play the lead? I love Elle Fanning for Swayzi and Nick Robinson from Love, Simon as Tyler. I haven't been able to choose someone for Daylan yet but for Linda, I would love to see Molly Ringwald.